The pioneering spirit has really invaded me, guys. My edible gardens board on Pinterest is growing a little every day, and I fantasize about the garden that, I swear, will be planted this weekend! I learned yesterday that Ma hated sewing as much as Laura did, and for a very brief moment, I contemplated pulling out my sewing machine. But I didn’t. Remember to come back and visit during July to see all the fun Laura posts I have planned! Are you reading anything good this week? 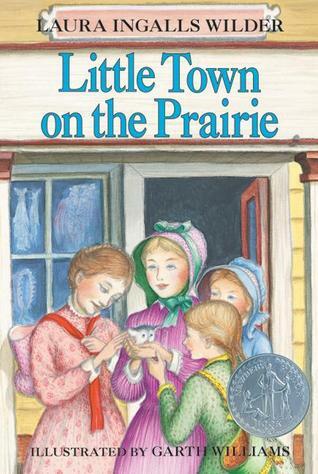 This entry was posted in books and tagged Laura Ingalls Wilder, weeky reads. Bookmark the permalink. I have to admit that, when it comes to sewing in our house, my husband is much better at it than I am! He could probably fix several torn seams in the time it took me to thread the needle….sigh. I hope you do come back and enjoy it, Lindsey. I’m beyond excited about it. My husband seems to think he’s a much better sewer than I am, but I disagree with him. I’m definitely nowhere near capable enough to make my own wardrobe, though.